Williamsburg Standard Size Classic Address Plaque measures 14" x 10.25" x 1.25" and holds up to four (4) 4" characters. One line sign displays your house number. Available in wall mount style (Whitehall model 1290) or lawn marker (Whitehall model 1292). Note: Lawn marker comes with one lawn stake. Each plaque is crafted from rust-free recycled aluminum. Paints have been specially formulated and weather tested to withstand the harshest elements. Custom made in America. Please type the text you desire in the Address line input box. and (shown in small images from left to right): BG black plaque with gold characters; BS black silver; OB oil-rubbed bronze; OG bronze plaque with gold characters; and PS pewter plaque with silver characters. NEW! See how it looks with your address in our Address Plaque Lab. Wall Mount. Lawn Mount. 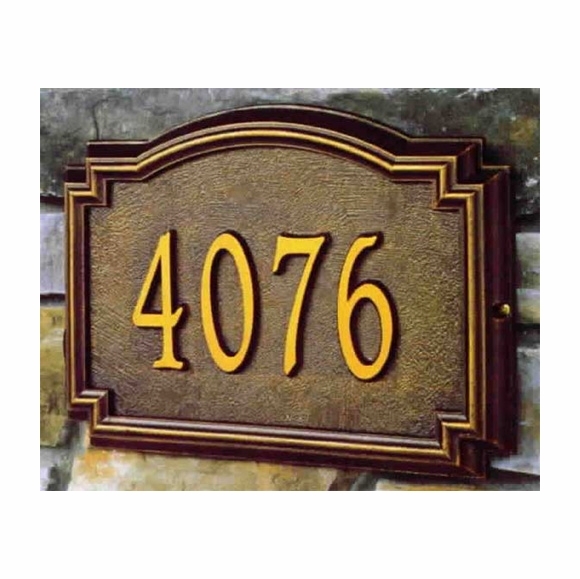 Need help selecting your address sign? Find any size, any shape, any color. Use our Address Sign Finder tool (click the link to open and then choose Help Me Select One). We love the address plaque we ordered! Our new number looks great attached to the house. Beautiful! Quality product. I purchased the bronze with gold letters. I would have given it an excellent except the screws that come with it are very short and had to purchase longer ones.